1- WTF? Why is there no kind of quarantine procedure here? The Enterprise investigates a ship where the crewmen were acting like a bunch of goons and ended up killing themselves yet they send a team over without any sort of sensible precautions. 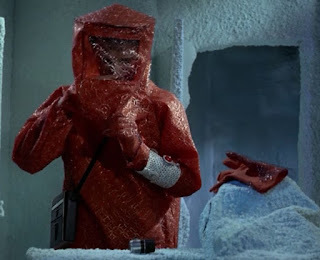 At least in The Naked Time they were wearing space suits--yes, they also stuck their grimy hands all over everything and then rubbed their noses but at least they made some kind of effort. 2- Geordie, OMG why are you touching everything?! And given that Geordie touches all the things, why, when he gets back does Crusher basically just say, "Welp. The scans aren't showing anything and there's no way that, on this mission to seek out all kinds of stuff we don't yet know about, there could be something I don't know about yet." Crusher does keep him in the sick bay but not in any sort of quarantine so when he feels like it he just up and walks out. 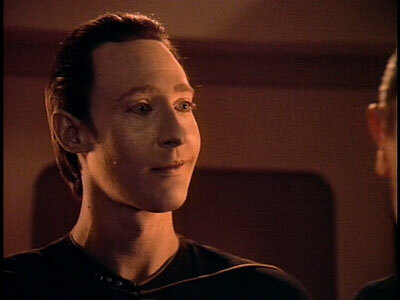 3- Data can get drunk/sick/infected. This is a fairly dangerous precedent to set so early on. Data can contract a disease? (Would it then be referred to as a computer virus? BWAHAHAHAHA) I'm not saying this is the wrong thing to do, or even that actually stick to it. I can't really remember right now. Either way, it seems foolhardy to burn that bridge in episode two--even if Brent Spiner is a great comic actor and without these scenes we'd never have the phrase "fully functional" in our geek lexicon. 4- There is no effort made, at any point in this one, to contain all the drunk idiots. When they realize Tasha's drunk no one says, "We should probably put up some force fields around her" or "We should send some medical guys down there with gloves and masks to round her up." No. Just let her wander around the lower decks like it's a pub crawl. I'm sure everything'll be fine. I still love this episode for all the reasons I detailed in my first post about The Naked Now. It's a classic for a reason. Trek is a show where people don't really talk about feelings or hug each other or cry. Getting them all wasted is actually a smart way to strip the TNG crew of their inhibition. They can reveal their desires, their pasts, their secret thoughts. Geordie wants to see like his peers. Troi wants Riker. Crusher and Picard want each other. Westley wants cake. And Tasha, heartbreakingly, wants gentleness. 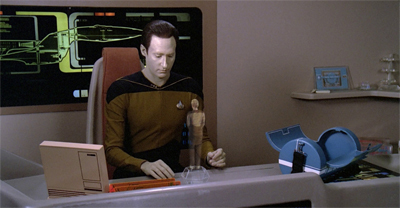 But TNG is still in its infancy here. The last time I saw Naked Now was immediately following TOS and I was still enchanted by the early days and early ways of Trek. And, of course, there is something to be said for that era but Trek evolved, along the way, into something different. Something quieter with a more concerted effort to be thoughtful and scientific. Since I last saw Naked Now I watched all the rest of Trek and then all of Voyager over again. So things like The Doctor's quarantine field in sick bay (which he could enter because of his hologram-ness)and Janeway's ability to brainstorm along with the chief engineer are fresh in my mind. In this early episode Trek is still Adventure SciFi and that's not really a bad thing--even if I might balk at some of these issues now. Without Naked Now it would've taken much longer to get at all the character stuff. As it is, we get a shortcut into the unfinished business between Troi and Riker, the latent longing of Picard and Crusher, the secret desire of Geordi, and the disturbing, affecting background of Tasha. Without Naked Now do we ever ship PiCrusher? Certainly we would lose "Fully Functional" and, far more importantly, we would lose the heart in the first really, truly emotional episode of TNG-- Measure of a Man.